Wino 4 Life: Wino4Life Goes on the Road - It's Vacation Time! A huge benefit of my pursuit of a second career is that it allows a much more flexible schedule than my first career as an IT Project Manager. Being able to successfully schedule a vacation of substantial length that would also work with my wife's (also an IT person) work schedule was very difficult. To make up for our last trip to Europe when I was only able to get away from work for a week and a half, we will be spending four awesome weeks on vacation this spring! You can count on lots of posts from the road - as our vacations are always filled with lots of great food, wine, and fun. This post gives a little preview of where will be going, and what we'll be hoping to experience in the world of food and wine. Not counting the Airport, we have never spent any time in Paris - quite a mecca of food and wine! Now that the era of "Freedom Fries" has passed, I'm searching for a beret that will fit my huge noggin and am very excited for our first Parisian experience. We are taking Air France, so we were able to add a stopover for a few nights in Paris and it did not impact the cost of our airfare. Also Air France has a "Premium Economy" section that does cost a bit more than coach - but has special seats and features that seem worth the extra money, without the business and first class second mortgage size fares. Hope we Have a Sunset Close to This One! We opted to stay at an Apartment so we would have access to a kitchen and could shop at local food shops, cook a meal, and pretend like we really live there! We will also be in search of fantastic bistros as well, but will be foregoing any of the super fancy Paris restaurants. After a bit of research we chose to stay in the Latin Quarter because of its proximity to many touristy spots, as well as street markets, and lots of spots to stock up on wine, cheese, meat, and other delicacies. I believe my wife may be blogging about eating Foie Gras with every meal in Paris - can you have (way) too much of a good thing. There will be Foie Gras! So, stay tuned for some first timers posts about Paris - focusing on wine of course, food of course, and some of our travelers experiences worth mentioning. Any suggestions about Paris from travel pros? Please provide below in the comments - and thanks in advance! Spain is a great country to visit - and Barcelona is a fun city with lots to do, see, eat and drink. 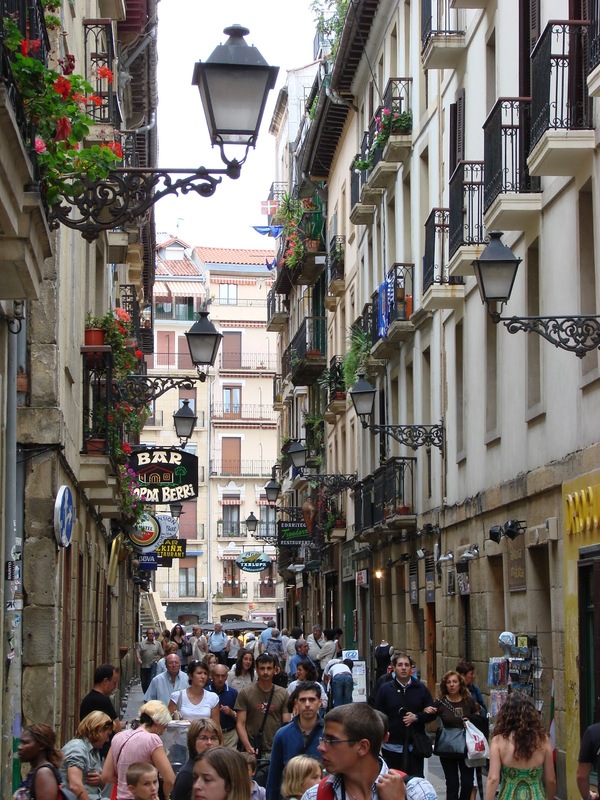 It is home to a walking street called "La Rambla" with interesting sights and even more interesting people. One of my favorite spots on La Rambla is the Boqueria Market. It is a huge warehouse size building full of vendors selling every type of food imaginable - with an unbelievable amount of fresh seafood, Spanish hams and chorizos, Spanish cheese, produce, - the best grocery store ever! We will only be in Barcelona for a short two days - but we will be staying in an Apartment so we can actually buy some of the great stuff ant the Boqueria - and not just take pictures! If you are a foodie and ever go to Spain - or are anywhere near Spain - I highly recommend adding San Sebastian to your list. A combination of world class restaurants, classic and avant-garde tapas, a beautiful beach - what else do you need? In fact of the five Michelin Three Star restaurants in Spain, three are in the San Sebastian area. As often happens, our vacation planning is largely around the places we want to eat. On tap for San Sebastian are a bucket list lunch at Asador Etxebarri - a spot where all the cooking is done on wood fired grills (they even offer grilled caviar!). This place consistently makes the list of top 50 restaurants in the world. This list should keep us busy at least for a night or two - please check back for pics and my words of praise about the great food San Sebastian has to offer. 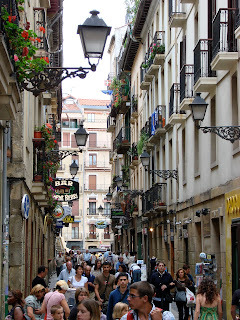 Oviedo is in the capital city of the province of Asturias, Spain. You may recall it was mentioned in Woody Allen's movie Vicky Cristina Barcelona. He is quite an icon in Oviedo, and you will even find a life size statue of Woody in town - just a bit creepy for me! Asturias is Sidra country in Spain. Sidra is a hard apple cider that requires a special, and highly skilled pourer. Sidra is literally poured from high overhead to a glass held down low. 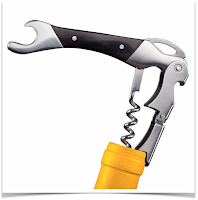 The impact of the pour quickly aerates and activates the natural carbonation. There is even a website dedicated to the proper pouring process: Sidra Asturias. Do Not Attempt this at Home! 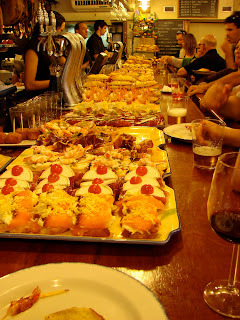 Oviedo is home to Gascona - a boulevard dedicated to Sidra and full of Sidrerías - or Sidra Bars. Gascona - The Boulevard of Sidra! One Sidrería we visited in the past that I loved and just have to go back to is Tierra Astur. OK, a little touristy as they do have a huge gift shop - but fantastic food, lots of wine and Sidra, and locals and tourists alike just having a great time. Plus did I mention some type of deep fried dough that comes with most everything? Like a small version of fry bread - you just can't go wrong with good fried dough. We will be spending some additional time in Asturias near Cangas de Onis - so I will be sharing other great treasures we experience - perhaps even some awesome home cooking from local friends! Our vacation adventures winds down with a stop in the Rioja region to visit one of our favorite wineries - Muga. Winery experiences in Spain are not like most US venues where you taste a few wines and you are on your way. Every winery we've visited in Spain, including Muga, provided a thorough tour of their winemaking process, some through their barrel-making process, and end up with sampling some of their wines. We were lucky enough to be invited to stop by Muga for a second visit and an even better experience by the Muga family who were representing the winery at the Wine Spectator Grand Tour in Las Vegas last year. I can't imagine what a fascinating and educational experience it will be - I cannot wait. Well - I better start packing and looking for the key to the wine cooler so as not to provide any temptation to our house-sitter! Don't worry I leave a box or two of wine in the fridge - I'm not totally ungrateful!!! Please check back for pictures and posts from the road. Any recommendations of things to do and see? Please comment below - and thanks!